Here's a fun bit of fan art crossed with aspirational product design. The team at sports comedy site Tauntr decided to mash up their favorite TV shows with their favorite sneakers, Chuck Taylor All Stars. 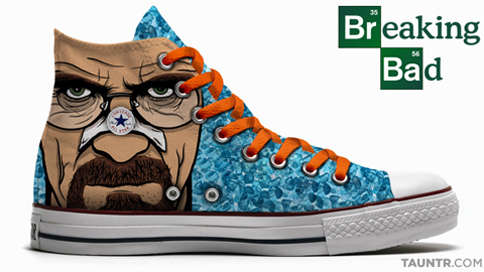 Lo, the busted-up likeness of Breaking Bad's Heisenberg and his signature blue meth appear on a Converse canvas. Someone at AMC's product licensing division might want to jump on this. From the moment the designs went up, commenters have been asking where they can buy a pair. (They can't.) A bloody homage to Showtime's Dexter and a living corpse from AMC's smash hit The Walking Dead are also in Tauntr's collection. Hey, the shoe brand is no stranger to zombie marketing. This could be a match made in hell!